Want this on Wii? Get buying the first! People have been questioning why Activision is bringing a port of the first Modern Warfare game, despite the second being released very shortly on pretty much every other platform under the sun (including the DS!). Activision, speaking at GamesCom, stated that if Modern Warfare sells well on Wii, we could be playing Modern Warfare 2 on our white waggle boxes in the future. The question is: when? By the time Wii owners get to play the next instalment, it's most likely the next CoD title will be on the shelves for other systems - it looks as if Wii owners will always be lagging behind the other platforms when it comes to the latest Call of Duty games. What are your thoughts, loyal readers? Let me see how the Modern Warfare turns out! Edit: That was close I did the 1 thing, so I changed it! meh, no thanks. Excluding the the Wii exclusives if I want to play an FPS I'll do it on PC. The Wii versions of these games get PC-ish controls but unfortunately tend to be gimped in the graphics department and on the other consoles you get PC-ish graphics have to put up with gimped controls. Sign me up for Red Steel 2 but other than that I am going to continue to avoid third party Wii FPS efforts like the plague. No way am I getting MW2 unless they take the first one seriously. @skywake: I'm avoiding Red Steel 2 - just looks like the polar opposite of Red Steel. Instead of mostly using a gun you're aimless flapping your hand around in close combat. Despite the great cinematics I'd say it's going to be an epic fail. If it's quality who cares if it's late? If Activision were able to clear licensing to port Elite Force I&II and Lucas Arts decided to put Dark Forces: Jedi Knight, Jedi Knight II and Jedi Academy out on the Wii I'd buy all of them as long as the ports were quality. @Calculon - it is very different to the original RS, I'll grant you that. I wouldn't say it's aimless flapping, though - the control you're given with MotionPlus is very enjoyable, and you can bring out your gun at any time. If anything, you may even have more control over when to use your gun, as the original forced you into one or the other quite often. We'll wait and see though. Sorry, there's no way I'm buying the Wii version, the PC version is simply a lot better in every aspect. I won't spend an extra $50 just so that I can use the Wii Remote instead of the mouse, when I could use that money to buy some more interesting Wii games like Cave Story, Red Steel 2, Virtua Tennis 09, and I'm also on the fence about Wii Sports Resort. I believe they should've made CoD4Wii a summary package of Cod4 and 6, cutting down on some levels to get the Wii's story progression to the same point it's on other systems. Of course I suspect what they're really going for is having the belated CoD4 port bomb at retail and point at that as the reason to no longer support the Wii (even if it sells millions they're probably going to complain that it's less than the other versions that weren't delayed). @KDR_11k - I don't think Activision got to be the biggest publisher in the world by intentionally setting their games up to fail. I think it'll sell well - certainly enough to cover costs - and we'll probably see more CoD in future. @calculon - The only reason I brought up Red Steel 2 was because it has "aimless flapping about" in the form of close combat swordplay. In a recent hands-on by IGN it was said that the basic sword combat was like a mix between Wii Sports Resort's Swordplay and Frisbee (for charged strikes) and that the Gun combat was like it was ripped straight from The Conduit (customisation and all). So with those comparisons in mind excuse me while I hype myself about Red Steel 2. I buy these for my 360! my wii is my retro console cause most of the disc games on wii stink,so long live the vc. 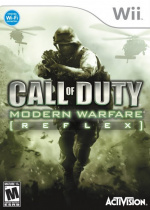 I personally cannot wait, to try out COD: MW on Wii. Bright ideas in gaming #2967: release a game on one console while you release the sequel on the other consoles. Wonder why it isn't selling as well than the sequel. I can see Activision using it as an excuse to not bother porting any more CoD games. The problem with this kind of thinking is that a lot of gamers own more than one system. If they really want Modern Warfare 2 they will probably be picking that up for the PS3 or Xbox instead of Modern Warfare for Wii, since they have already played it. I own multiple systems but I prefer the Wii. I love playing fps on the Wii due to the controls. If Modern Warfare 2 was coming out at the same time (all systems) I would be picking up the Wii version. I am still planing on playing Modern Warfare on the Wii to see how it ends up but I really think that they should have just put Modern Warfare 2 on the Wii now. I don't give a **** about Modern Warfare 2. I hope Modern Warfare bombs, because do we seriously want an dumbed-down port again? This game is ideal for the wii...as the CoD's have been. "I don't give a **** about Modern Warfare 2. I hope Modern Warfare bombs, because do we seriously want an dumbed-down port again?" You have literally no idea if it's dumbed down. I am getting tired of this whole "if the port sold well, we may consider porting another game 2-3 years later than other consoles just to squeeze the money out of wii owners"
that happened to RE: 4 and many other games out there. Even The Conduit used the excuse so that they can make a sequel. Grr.. I hate pity advertising. 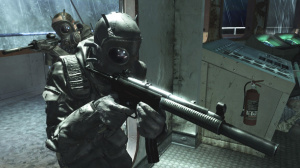 If they are hoping to sell lots of MW1, they might not want to announce the sequel just yet. Doh, too late. @skywake: Personally I don't take any feedback from IGN as testimony of a game's quality anymore (strangely enough, not since the Wii launched) and I'd be seriously worried if most high-end developers haven't managed to pin down a decent way of handling targeting with the IR pointer by now. I also think the sword fighting section of Wii Sports Resort looks the least appealing of all the games. Then again I think the whole package is largely pointless along with the MotionCludge peripheral. Everybody, go out and buy it now. So it can look like this? I don't think so. THIS is a prime example of how 3rd parties view Nintendo and Wii. Worst, Nintendo can never win. If its HD, it won't be HD-enough. if its HD-enough, then its kiddie. if its not kiddie enough, then 3rd parties don't sell. etc, etc. this game is going to easily have the best online of any game on the wii, just like how cod waw had the best till conduit. Its worth noting that cod waw still has better connection sync then the conduit. Oh and one more thing. WHERE IS ALL THE GAMEPLAY FOOTAGE? Cod waw was the same befor its release i could only find three off screen single player vids until it came out then youtube started to have FAN posts. When will publishers learn that PEOPLE DONT CARE ABOUT SCREENSHOOTS JUST SHOW ME SOME DAMN GAMEPLAY! That is so stupid they should just see how many WaW sold and release the first then as a bonus disc have the second as a demo then if you like it go buy it. with black opps on our side who needs mw2?